The 77-year-old priest is recovering from the stabbing attack in Montreal, police say. (CNN) - While shocked parishioners and a television audience watched, a man stabbed the elderly rector of St. Joseph's Oratory at Mount Royal, Canada's biggest church, as he led Mass on Friday morning, Montreal police said. Police said the stabbing was not considered a terrorist attack. "Today's event is an individual act committed by one individual," police said on Twitter. The church tweeted that Father Claude Grou was "out of danger." The 77-year-old priest was taken to a hospital and is recovering from his wounds, Constable Caroline Chevrefils said. St. Joseph's Oratory in Montreal. "What a horrible attack at Saint Joseph's Oratory in Montreal this morning," Prime Minister Justin Trudeau tweeted. "Father Claude Grou, Canadians are thinking of you and wishing you a swift recovery." Montreal Mayor Valerie Plante tweeted: "What a horrible and inexcusable gesture that has no place in Montreal. I am relieved to learn that the life of Father Claude grou, Rector of the @osjmr, is out of danger and that his condition is stable. On behalf of all Montrealers, I wish him speedy recovery. " "We are all shocked by an act of violence taking place here in a place dedicated to peace," Lépine said. 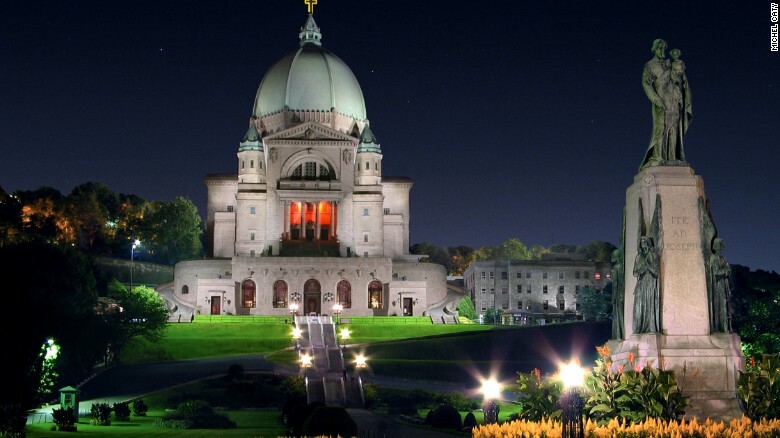 St. Joseph's Oratory, the largest church in Canada, is in the culturally diverse Côte-des-Neiges neighborhood. CNN's Tony Marco contributed to this report.